I spent the day with one of our ambassadors, Mia. She is our youngest ambassador. Mia is a student at Naperville Central high school. She loves all things photography, music, and Jesus. She is outgoing and loves to be around people. Mia is very involved with her church. Whether she is worshipping, leading a small group, or taking photos she is her happiest self. One of Mia's greatest joys besides church is photography. Patience and motivation are key factors in how she has been successful. Mia will never pass up an offer to go to Chick-fil-A (also known as her favorite restaurant). She loves plugging in headphones and grabbing a good book- they're essential to help her relax. Mia beamed with excitement as we ordered our drinks from Owl and Lark. It was her first time in the juice bar and she was amazed with the plethora of options: smoothies, juices, hot drinks and snacks. The barista calls out "Mia" and hands over the pink dreamlike "Pitaya Smoothie". "I didn't know it was going to be pink!" Mia exclaims. "It's really pink. I love it". She continues, taking a sip of her pineapple-mango smoothie. She looks around, admiring the juice bar and noting how conveniently close it is to the studio. It's perfect for refueling after a yoga class! Feeling rejuvenated after our smoothies, we headed back outside to walk the streets of downtown La Grange. We hunted for street art and went window shopping- chatting about everything from yoga to camera gear and everything in between. Next up was Elmhurst. We found a peaceful spot in the Wilder Park Conservatory to meditate and spend time in nature. The sun was beaming down on us as we laughed and walked the garden. Admiring the beauty of the world and feeling the serenity of the moment. She explained how yoga is something she is working on practicing more. Mia reminisced on the days she and her grandmother would take their Tuesday yoga class. She noted how peaceful and energetic she feels after yoga. Mia is wearing "Define Your Inspiration" (DYI for short) leggings. This is one of the newer brands we carry at our four studio locations. We're particular about the brands we partner with and choose to include in our four studios. Why? It's because we care about you and want you to look and feel your absolute very best! Based out of Houston, Texas, DYI is an athletic brand that incorporates style and comfort. They believe that "feeling comfortable but sophisticated helps us move through life easily from workout to work, school days to date night or errands to homework"- we couldn't agree more! 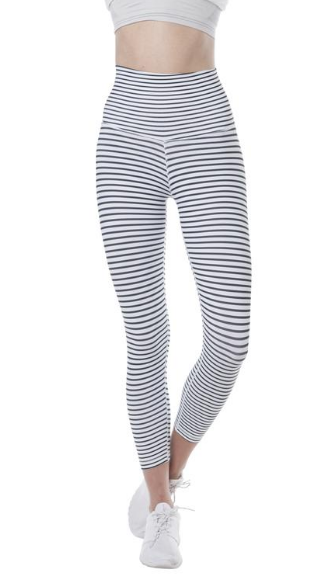 Each one of our locations (Oak Park, Berwyn, Elmhurst and La Grange) has different leggings. Berwyn is filled with deeper colors while Oak Park is home to funky striped designs. Stop in and check out the patterns! Macaila is a yoga teacher in training, writer and photographer. She likes meeting new people, is passionate about helping the community and also enjoys traveling, all kinds of dessert and cheesy jokes. She aspires to become the best version of herself by investing in others. Yoga has helped her become more centered and focused on serving her higher purpose. In January she started the social media campaign called Operation Beautiful Nation. OBN is focused on raising awareness towards social injustice, which provides people all of the globe to take action and tackle these issues with a peaceful solution oriented attitude. Macaila hopes to someday eliminate social injustice and wants you to help.